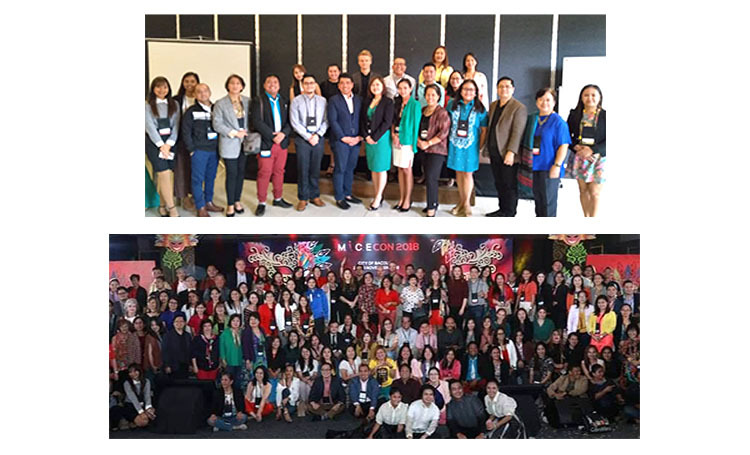 PCAAE, represented by its Council Secretary, Mr. Enrique I. Florencio, attended and facilitated an afternoon break-out session on business and professional development program at the Philippine MICE Conference (MICECON) 2018, the biggest gathering of Meetings, Incentive Travel, Conventions and Exhibitions (MICE) professionals held on November 27-29, 2018 in the City of Bacolod. The MICECON is an annual event organized by the Philippine Department of Tourism (PDOT) through its marketing arm, the Tourism Promotions Board (TPB), to serve as a platform for MICE stakeholders to learn global trends and travel tourism from global experts, new approaches in sales and marketing, business and professional development, convention and exhibition management, incentive travel, events design as well as corporate social responsibility (CSR) activities and networking opportunities in a themed social functions. Other highlight of the Bacolod event was the presentation of the Philippine MICE Roadmap 2030, a public and private sector partnership initiative that aims to propel the country to become one of the top MICE destinations in Asia.